On a day with highs in the 20’s Liberal warmed up the nets in the Big House Thursday night. 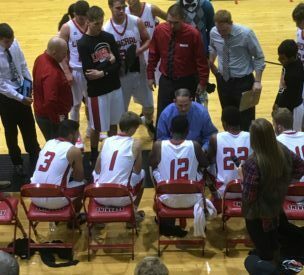 Liberal made nine of 14 three pointers on the way to a 63-43 win over the Hereford Whitefaces in the Big House. Cade Hinkles scored 14 while Markalyn Eatmon added 10. Liberal led 16-15 after one and 33-25 at halftime. The Redskins led 51-36 after three and led by as many as 21 on the way to the win. Liberal is 3-0 for the first time since 2008-09. The Whitefaces are 4-5 and play Dodge City at 1:30 Friday afternoon in the Big House as part of the Conestoga/Community Bank Classic. The Redskins face Hutchinson Trinity Saturday at about 4:15 in Cheney on 1270 and kscbnews.net. The game is a make up game for a lack of another team in the Conestoga/Community Bank Classic.